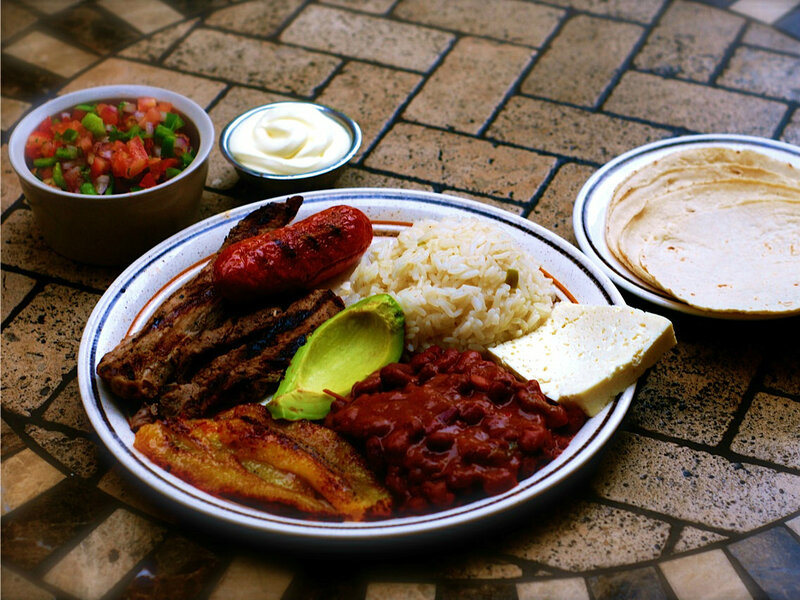 Honduras has many national dishes depending on the regions. Plato Tipico is one of the most popular because it combines the most liked and used ingredients in a dish that will satisfy most tastes! It includes a variety of foods, which are prepared separately, but form a complete meal: Grilled meat and pork sausages, stewed beans, chismol, fried plantain, and rice. These are served with sour cream, white fresh farmer’s cheese, avocado and corn tortillas. Cut the meat (beef and pork) into long strips and place in bowl. Mix in the salt, pepper, mashed garlic, olive oil, and vinegar. Marinate for at least one hour prior to grilling. When the barbecue ready, place the strips of meat and the four sausages over the grill and cook until desired doneness. Cut onion and bell peppers into thin slices. In a pot, heat the olive oil over medium-high heat and add the sliced onion, bell peppers and mashed garlic cloves. Sauté for about 3 minutes or until tender. Add the two cans of beans. Stir and lower to medium heat. Add spices and ketchup. Mix thoroughly. Add water. Lower the heat to medium-low and simmer for 15 minutes. Mix vegetables, season and add the lemon juice. Peel the plantain and cut it in half. Then cut each half lengthwise into ½ cm slices (about 4 slices from each half). In a frying pan, heat vegetable oil over medium-heat. Fry each slice until each side is slightly browned (about 3 minutes on each side). Remove from pan and keep warm. In a pan, heat vegetable oil over medium heat and add the diced green bell pepper, onion, and garlic. Sauté for 2 minutes. Add the washed and drained rice and sea salt, and continue stirring for 2 more minutes. Then, earefully add the hot water. When the water starts to boil, lower heat to medium-low and cover. Simmer until all water has been absorbed and the rice is cooked, (about 20 minutes). When all the components of the dish are ready, arrange them in 4 plates. Cinthya Simon is from Honduras and works full time as a civil engineer. She started cooking when she was 13 years old and had to help her mother to prepare food for the family. It has since become a hobby which she enjoys greatly.